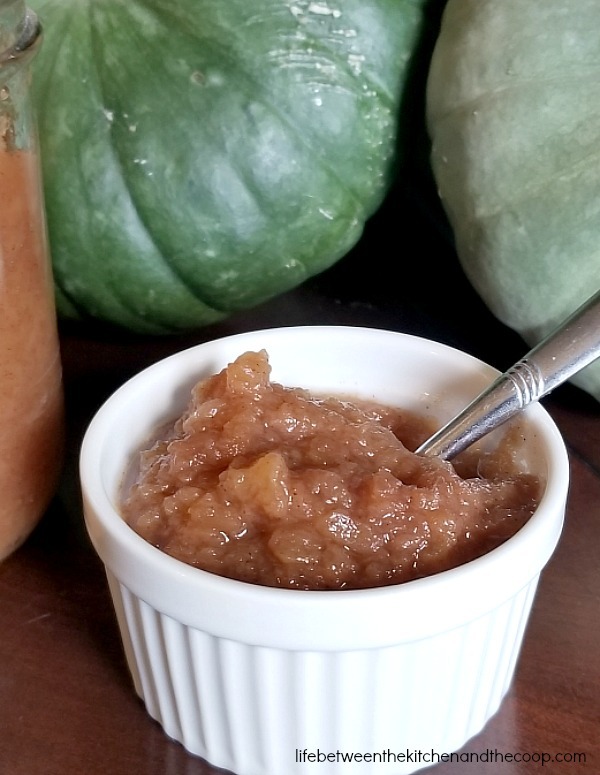 Homemade cinnamon applesauce is one of my favorite fall apple recipes. It is a delicious comfort food, whether served warm or cold! It’s a great way to use your fall apples! Mind you, unless you will eat it all within a week or two (not likely unless you have a biiiiiiiiiig family), you will want to preserve the homemade cinnamon applesauce by canning it. Directions for water bath canning the cinnamon applesauce are also included in the recipe below. 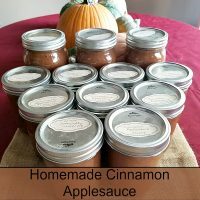 ***If you are going to can your cinnamon applesauce, I recommend you read the all of the instructions in this post BEFORE turning on your pressure cooker. 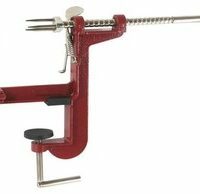 This is especially important if you are an inexperienced canner. That way you will be sure to do things in proper order and also are sure to have everything you need on hand. 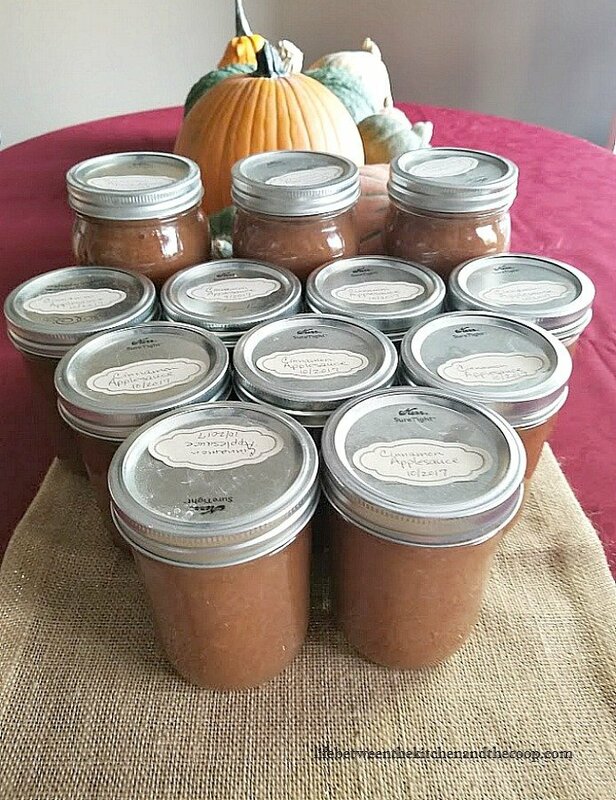 Before we get started, I want you to know that when I make homemade cinnamon applesauce, I do it in bulk (making several batches) to make it worth canning. Once one batch is done and the pressure released, I put it in a separate pot on the stove (don’t turn the heat on yet). Once each batch of it is done, I add them all to the same pot. Then while I heat my jars and lids to can the cinnamon applesauce, I turn the pot with the cinnamon applesauce on medium heat and stir often. I keep it hot until the jars and lids are ready. In order to prep for canning, the first thing I do is load my mason jars and screw on caps into the dishwasher. The jars need to be HOT when the cinnamon applesauce is ready to put into them, so depending on how long of a cycle your dishwasher has, you will want to figure out when to turn it on accordingly. You want them to be in the rinse or dry cycle when you are ready to fill them, that way the jars are ready and hot right when you need them! The next thing you should do is have the rest of your canning supplies ready. That includes your wide-mouth funnel, jar lifter, lid magnet, and a hand towel. I put the lids in a sauce pan of water on the stove top, but I don’t turn it on yet. You will also want to have your hot water bath pot filled with water roughly 2/3 (for quart jars)-3/4 (for pint jars) of the way full of the way. It needs to be filled high enough to cover the jars once you sink them, but you don’t want the pot so full that the water overflows onto your stove when you put the jars in. ***NOTE: If you have too much water in it when you go to sink the jars, you can use a mug to CAREFULLY remove some of the excess water BEFORE you sink the jars. To start with, I used 40 small to medium-size apples per batch. First, peel and slice your apples. For that tedious job, I was VERY glad I had an apple peeler/slicer/corer on hand. It made the process fairly quick. 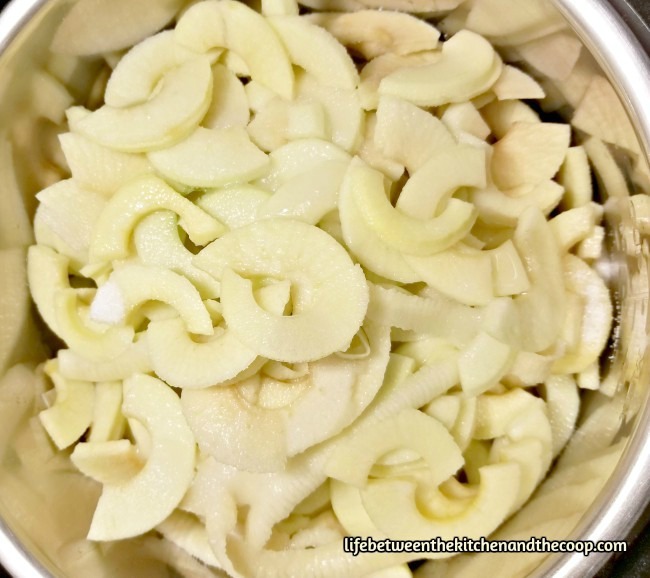 Once the apples are all peeled and sliced, put them in the pressure cooker pot. Add 1/4 cup of water and 2/3 cup of sugar. On the manual setting, cook the cinnamon applesauce ingredients at high pressure for 7 minutes. When the seven minutes is up, wait for the pressure to release completely. After all of the pressure has released completely from your pressure cooker, unlock and open the lid. The apples are very soft at this point, so you can use a potato masher (that’s what I use) or an immersion blender to blend it into sauce texture. Now you have homemade cinnamon applesauce! Doesn’t it look yummy? One at a time, carefully remove hot jar from dishwasher and place a wide-mouth funnel in top of the jar. Using ladle fill the jars with cinnamon applesauce, but leave about 1/2 – 1 inch of head space at the top (because it will expand). Using your lid magnet, remove a lid from the boiling water. Carefully place it on the jar. Wipe the bottleneck and top of lid dry with a towel and then screw on the cap. Using your jar lifter, place it in the water bath rack (the water in your water bath should be boiling). Repeat until all of the cinnamon applesauce has been jarred. Then, sink the jars in the boiling water bath. Replace the water bath lid. 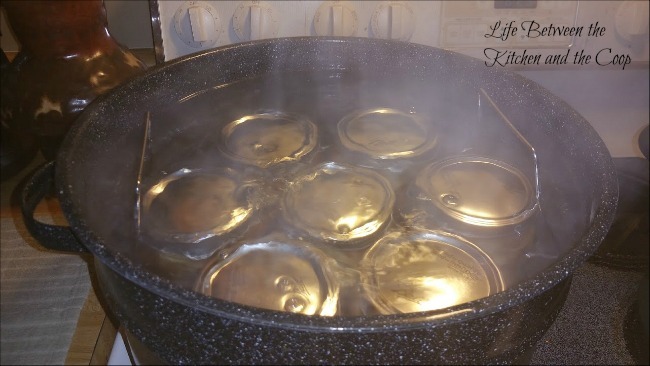 Keep the jars at a rolling boil with the lid on the water bath for 20 minutes – doing this is called processing. Adjust for altitude as needed. Next, turn off the heat and remove the water bath lid, being careful not to get burned by the steam. Once the steaming stops, use hot pads and carefully lift the tray out of the water bath. Leave them in the tray-lifted position to cool for 10 minutes or so before you remove them from the water bath with your jar lifter. Set them on a towel on the counter to dry. Once dry and completely cool, use a sharpie or canning jar labels to label the lid. Now put those beautiful jars in your food storage! Yum! 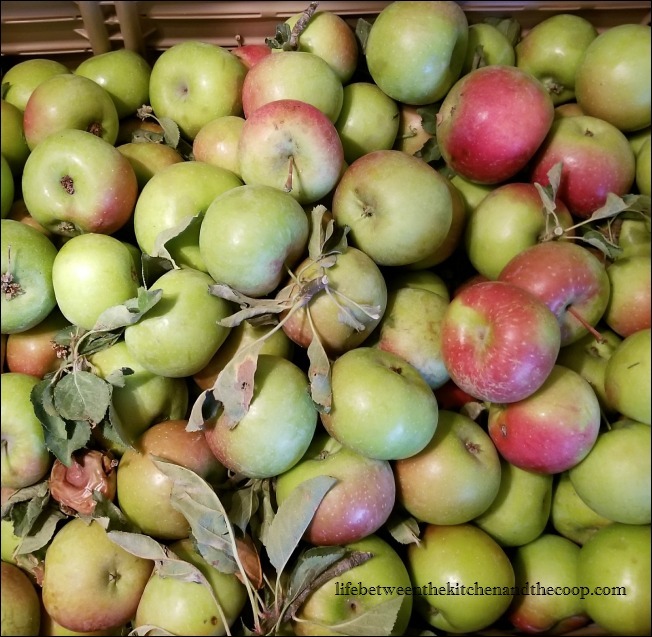 Tell me, what is your favorite way to use your fall apples? 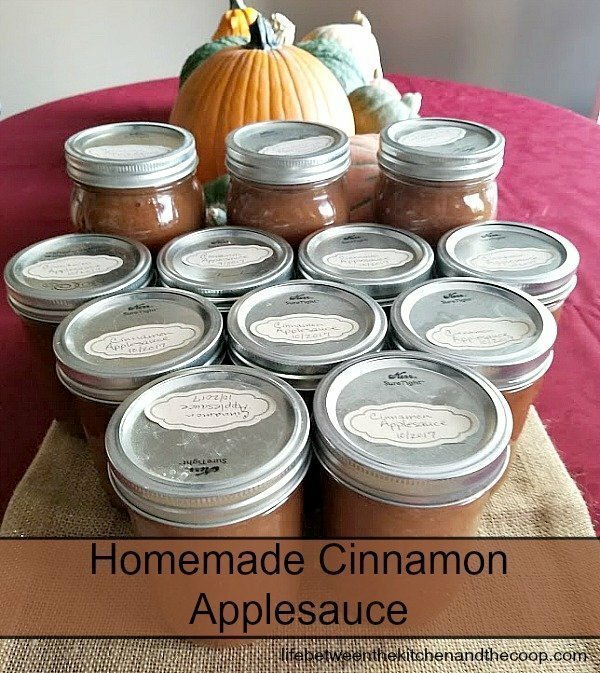 Homemade cinnamon applesauce is one of my favorite fall recipes. You can make it in your electric pressure cooker or instant pot. It is a delicious comfort food, whether served warm or cold, and makes an easy and yummy side dish. They are great to can for food storage, too! I've included the instructions. It’s a great way to use your fall apples and boost your emergency preparedness at the same time! In order to prep for canning, the first thing I do is load my mason jars and screw on caps into the dishwasher. Make sure you heat enough jars! The jars need to be HOT when the cinnamon applesauce is ready to put into them, so depending on how long of a cycle your dishwasher has, you will want to figure out when to turn it on accordingly. You want them to be in the rinse or dry cycle when you are ready to fill them, that way the jars are ready and hot right when you need them! You will also want to have your hot water bath pot filled with water roughly 2/3 (for quart jars)-3/4 (for pint jars) of the way full of the way. It needs to be filled high enough to cover the jars once you sink them, but you don’t want the pot so full that the water overflows onto your stove when you put the jars in. Add the remaining ingredients and put the lid on the electric pressure cooker. The apples are very soft at this point, so you can use a potato masher (that’s what I use) or an immersion blender to blend it into sauce texture. At this point you can serve it warm or chilled, OR proceed with canning it. Then, sink the jars in the boiling water bath. ***NOTE: If you have too much water in it when you go to sink the jars, you can use a mug to CAREFULLY remove some of the excess water FIRST. Now put those beautiful jars in your food storage!